The model 17405 provides a rapid and accurate determination of lung Residual Volume for the purpose of body composition analysis. It is based on our new "Tri-Gas" analyzer and uses the method of nitrogen washout. This technique, when combined with hydrostatic weighing, is considered to be the Gold Standard in body composition determination. Perfect for accurate Residual Volume and FRC Measurements. 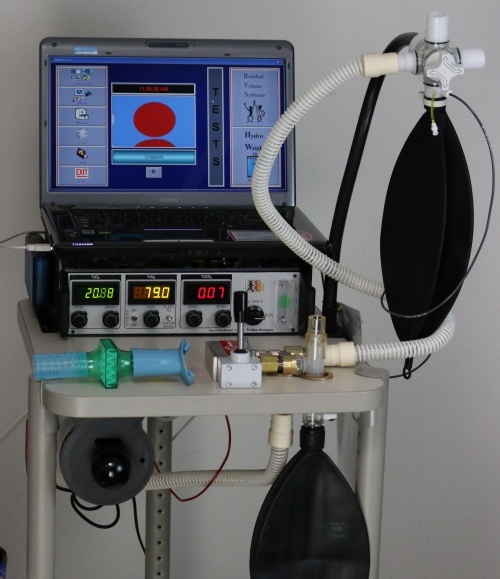 May also be used for Total Lung Volume using larger rebreathing balloon. Rear Panel Analog Outputs:	Separate BNC connectors for O2, N2, CO2. Included Accessories: Computer interface, 2 multi-function valves, mouthpiece, filter, power cable, sample line tubing and instruction manual. User must supply a tank of medical grade 100% oxygen with pressure regulator. Large tanks are usually rented from local gas supplier. User must supply computer with Windows xp; Win 7 or 8 (32 & 64 bit) or order from us, see below.